Tasting. Seeing. Feeling. Hearing. Giving. The first four experiences await you as you travel to Greece in December 2017 as part of this limited-offer trip sponsored by Folkmoot and coordinated by Wilcox World Travel & Tours. The fourth experience – giving – is how your trip purchase supports the efforts of Folkmoot. 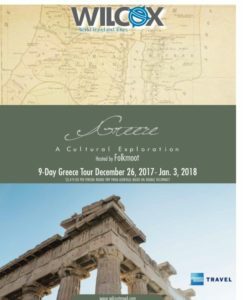 Folkmoot is working with Wilcox Travel to offer an affordable, informative and fun eight-day trip to Greece, departing December 26, 2017, and returning January 3, 2018. This trip is for those interested in history, antiquity, art, archeology, religion, culture, and the joy of traveling to different parts of the world. 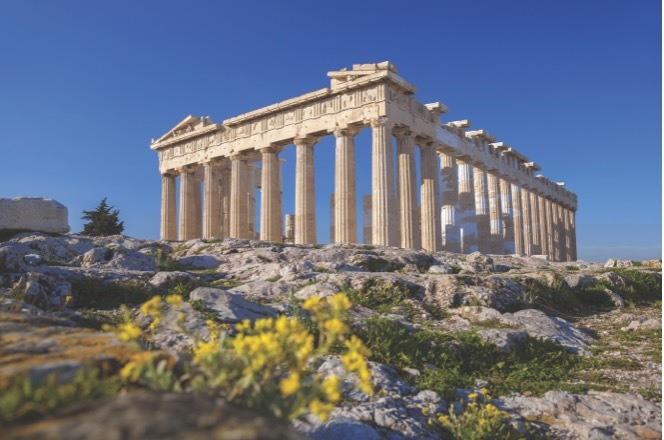 No place on this earth brings world history to life more than Greece. Not only can you be a part of this amazing week, but you can know that your trip is bringing important programming to the Folkmoot community. Based on the number of trips sold, Folkmoot can earn free trips, which in turn will become raffle/fundraising opportunities that will help Folkmoot with reaching its goal to grow its year-round programming. Therefore, your trip aids Folkmoot’s efforts to increase its role in leading cultural conversations, expand its youth and family programming and continue its efforts to restore the historic Folkmoot Friendship Center so that it can boost the number of concerts, dinners, classes and programs it offers western North Carolina communities. Individuals who purchase a trip to Greece will receive a ticket to the Candlelight Closing in 2018. 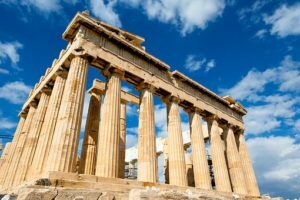 Tour the Parthenon, the Acropolis, Theater of Dionysus, the Agora and Mars Hill before traveling to Arachova, a small town famous for its flokati rugs, cheese, honey, and wine. 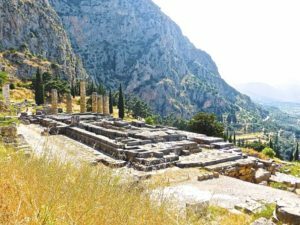 Overnight in Delphi, the home of the ancient Oracle. Go to www.folkmoot.org and get your tickets to experience the wonder of international culture through music and dance! Folkmoot is Going To Centre Stage in Greenville, SC!